L-R Essie Fear & Desire, Sally Hansen Himalayan Blue, Barry M Coral, Barry M Mint Green, No7 Stay Perfect Nail polish Cheeky Chops, H&M Glitter Polish in Bronze, Catrice Nail Polish Pool Party At Night, Leighton Denny The Heiress, Essie Mesmerized, H&M Nail Polish Come Along With Me, MUA Nail Polish (old packaging + formula) Shade 15. So in summer I like to wear quite a variety of colours, I like my pastels but I also do love a good bright shade too. This is a lovely gorgeous hot orange shade. It is bright but it is not so neon that you need your shades on just to look at yours nails. I love the formula of Essie nail polishes and the brush is awesome making your nail polish glide on with no difficulties! This a lovely cool blue, which is nice if you fancy something not too racy like the essie polish above. The brushes on these bad boys are awesome and you get a massive bottle not that you ever really use up a whole nail polish unless you use it non-stop. This is great creamy orangey coral colour. This is more on the red side, but that just makes it a little different to other colours out there. Oh my mint, this is a pretty cool pastel mint colour! It does take a few coats to get it opaque, so the first is a little on the streaky side, but that is the usual with light colours. Firstly, the name is awesome right?! But besides that, the colour is a beautiful pinky coral. I love the formula of these polishes and that they dry in pretty quick time! Lovely to put on your tootsies! This could be likened to the models own ibiza mix. Although it doesn't have as many colours and different sizes of glitter, it is superb. I love wearing it on it's own or as an accent nail over another polish. I bought this is in a department store in Germany last summer, I thought that colour was really pleasant. I hadn't really got a colour like it at the time. What I also found helpful is that they had nail wheels, with all of the shades on them. Which really gave you a feel for what they actually looked like on (why don't we do that here?). This is a pretty bright teal colour, I have recently been wearing this on my toes. It looks so lovely and I think I will be buying some more of H&M polishes very soon! Last but no means least! This is very fiery hot pink colour. I love mua nail polishes in general but this one is my favorite. I love the formula of them and the colour range. You cannot buy this exact nail polish as they have changed the packaging, names and colours. The closest you can get to this is called "Hot Pink". 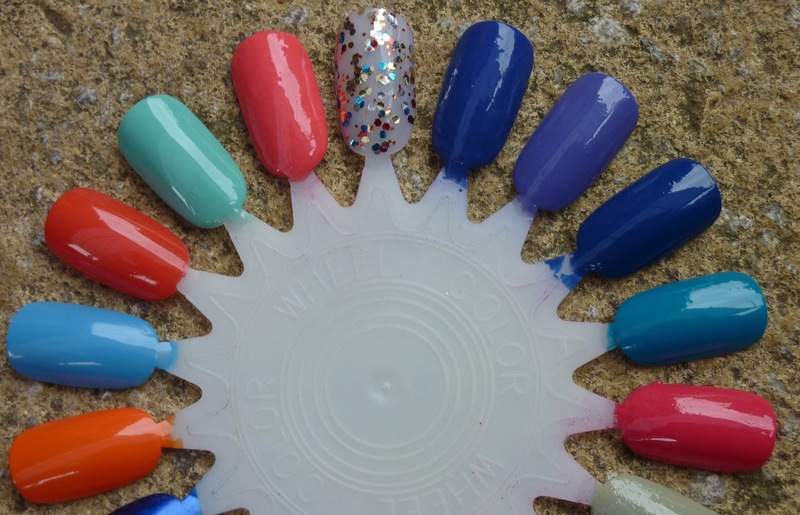 So that is my post on my top summer nail polish picks, I would love to know what yours are! A Note from Shona: Thank you Emily for guest posting! I really loved reading this post about Emily's summer nail polish picks, I hope you did too! I love the look of Barry M's Mint Green!